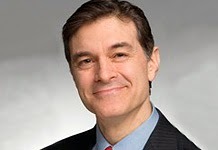 On a recent tv episode on personal embarrassing medical issues, Dr. Oz admitted that he sweats excessively especially before each show. He went further in responding to a question and admitted that he wears Kleinert's Stay-Rire Garment shield as protection from sweating wet-through, stains and odors. He called it a lifeline and then showed the audience the product.